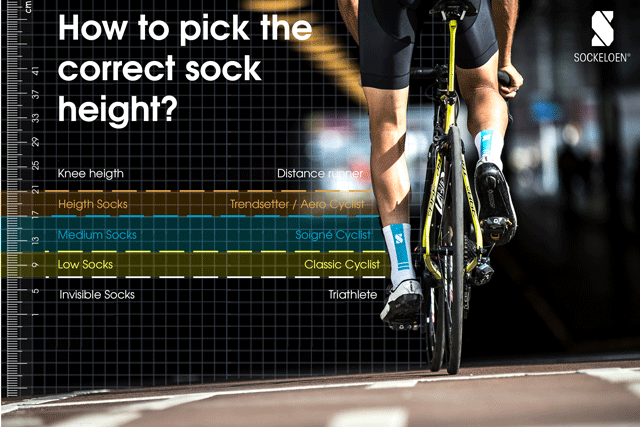 ➙ At Sockeloen we know best how valuable the wright sockheight is for a cyclist. It's more then just a measurement. It's a statement. That's why we developed the guidelines displayed below, to help you pick the correct sockheight ! ➙ The most common size we use is ONE SIZE. We developped this special fit by using extra elastic material. This size is wearable by almost everybody (EU size 39 - 46 ). You can navigate through the top navigation tabs Height or Size to select your preferred specs. The sockheight is listed in the product description and is measured like the vertical arrow within the picture below. 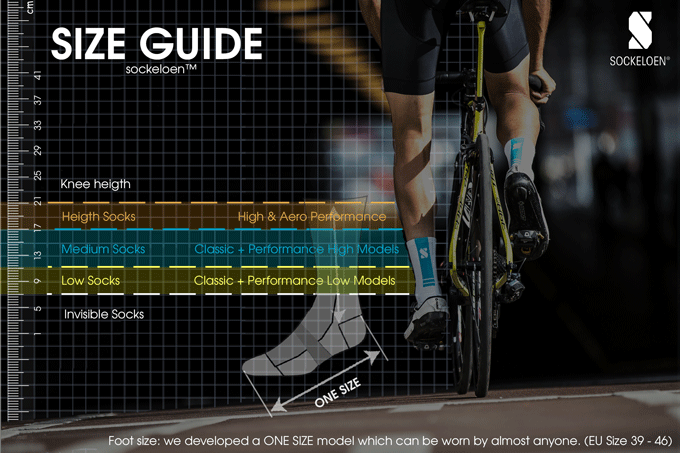 ➙ The second size guide is applicable to the Classic models and the All White / Black socks. They are available in size 35 to 40, size 40 to 45 or size 45 to 50. You can navigate through the top navigation tabs Height or Size to select your preferred specs. The sockheight is listed in the product description and is measured like the vertical arrow within the picture below. If you have any questions about the size, you can always contact us. When your socks don't fit please let us know, if they have not been worn you can return them to Sockeloen and you will get your money back. ➙ You can send us a message on info@sockeloen.nl and we will be happy to help you.